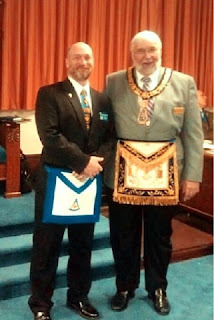 Grand Master Terry Seward visited St. Joseph Lodge No. 970 on Friday and conferred a third degree. It's not very often you get to see something like that, and there was quite a crowd. It was a very impressive degree. Ogden Lodge was very well represented at the event thanks to a special invitation by their Master Tracy Hogan (who is also a member of Ogden). In fact all of the Ogden Lodge members who attended took part in the degree. The photo is of Ogden's Master Aaron Ketchum and the Grand Master. Thanks again to St. Joe for including us in this rare privilege.